To help introduce you to more of the magnificent Modern Scholar series where great professors teach you, we're offering another 10 free lectures to download from 10 of their top courses. These recorded lectures are taught by eminent university professors. Here are the 10 lectures you can download right now on MP3. Note: For downloading these files you have to right-click on the Download button and select Save Target As... Then it will allow you to download the file to an assigned place on your computer. 1. What Was the Enlightenment? In this lecture Professor James Schmidt talks about what Immanuel Kant called "man's emergence from his self-imposed immaturity". The Age of Enlightenment began the elevation of science and reason in Western civilization. It was an era where great thinkers began to think for themselves and question the absolute rule of religious and political authorities. Professor Schmidt talks briefly about many of the key figures of the Enlightenment including Denis Diderot, Isaac Newton, Immanuel Kant, Adam Smith, and Voltaire, and he talks about where the ideas of the Enlightenment prospered primarily in England, Germany, and France. Learn how the "The Great War" started in this lecture from Professor John Ramsden on the buildup to World War I. He talks about the rise of Germany as an imperial power which sought to rival Britain. Ramsden also describes the alliances that had formed at the dawn of the 20th century such as the Franco-Russian Alliance which the British would eventually join and the alliance between Germany, Austria, Hungary, and Italy. As these alliances began to entangle, Germany saw itself as being threatened and when the Archduke Franz Ferdinand was assassinated in June of 1914 it lead to a series of events which triggered the world's first truly global war. At the end of the lecture Ramsden examines which nation was most responsible for the war and he cites that most contemporary historians blame Germany. In this lecture Professor Michael Drout introduces rhetoric through the Speech-Act Theory outlined in John L. Austin's influential work How to Do Things With Words in which Austin posits the locutionary, illocutionary, and perlocutionary speech acts. Professor Drout provides examples of how these speech acts are used in everyday life to influence reality. He also shows how people misuse these speech acts to get what they want such as when politicians make promises about things they don't have any control over. It's an introduction to the world of rhetoric. In this lecture Professor John Kricher provides a concise overview of what modern science currently knows about dinosaurs. A lifelong dinosaur lover, Kricher explains the basic facts, including size and weight ranges, dinosaur intelligence, and how they have survived into modern day in the form of birds. Ever since the first fossils were identified in the early 19th century, our dinosaur knowledge has evolved rapidly, and this lecture represents the most current developments. If you're curious about the Crusades, this lecture from professor Thomas F. Madden sets the stage for what became a 400 year war between Christians and Muslims over the Holy Land and between competing sects within these religious ideologies. This lecture focuses on the history of Christianity from its humble beginnings to its rise to prominence in the Roman Empire with the conversion of the Emperor Constantine, the development of the Papacy, and the formation of the Byzantine Empire. It's an informative lecture covering a lot of Christian history from the time of Christ to the start of the First Crusade in the 11th century. In this introductory lecture Professor Kermit Hall lays out the basics of the Supreme Court from its origin in the U.S. Constitution. He focuses on how it developed from the limited early role it played in the United States to the powerful force it plays in American society today where it interprets the constitution and provides rulings on the legalities of major issues such as slavery, abortion, and more. If you want to learn about the Supreme Court or refresh what you might've learned in the past, then this lecture is a good place to start. 7. What is a Star? Professor James Kaler shares his genuine awe and lifelong fascination with the stars in this opening lecture. He describes what a star and provides info about our closet star, the Sun. Kaler covers the colors, brightness, and sizes of stars, the history of stars, and the number of visible stars. The lecture will help you put things in perspective in relation to our universe. In this introductory lecture to the Philosophy of Thomas Aquinas, Professor Peter Kreeft provides a brief biography of a theological titan. Kreeft views Aquinas' prolific body of work as an important bridge between Greek philosophy and the early western philosophers such as Descartes. Seeing no division between faith and reason, Kreeft describes Aquinas as a quintessential truthseeker who was willing to take from secular and religious sources alike in the formation of an inclusive philosophy that is still vibrant and alive to this day. In this lecture Professor William McKeen discusses the history of journalism in America and specifically journalism which took on a literary quality of storytelling. Through his research Professor McKeen unearths journalism which resembles what would become the late 20th century art form of literary journalism espoused by authors such as Tom Wolfe, Hunter S. Thompson, and other creative nonfiction writers. The last half of this lecture focuses on Mark Twain and the literary merit he brought to his journalistic efforts. McKeen reads an extensive excerpt from Mark Twain's amusing report on the state of journalism in Tennessee. 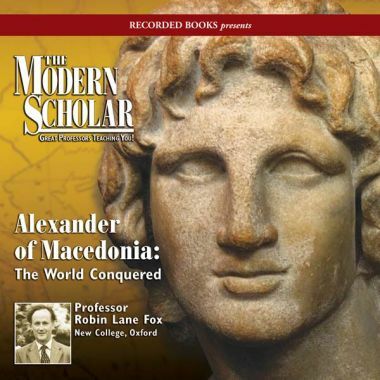 Professor Robin Fox begins a thorough biographical portrait of Alexander the Great in this first lecture for The Modern Scholar Series. Describing his subject right off the bat as probably the greatest king and conqueror the world has ever seen, Fox offers a brief sketch of the Alexander as a historical figure and then provides the context of Alexander's time, place, and the most important people in his life. From the start Alexander's relatively short, but incredibly eventful reign was chronicled by court historians, and this has proven to be a mixed blessing for modern analysts when it comes to separating fact from fiction. Enjoy these free sample lectures. At LearnOutLoud.com we plan to listen to all of these Modern Scholar courses! Join us in listening to the classes of some of the best teachers in the world.